This story at TorrentFreak about one man building a BitTorrent search engine and, once it got going, hosting it for free on Google App Engine is a wonderful tale of our times. "David told TorrentFreak that he initially started the site on his own Internet connection. When the site started to attract more visitors, he had to find an alternative. Google’s App Engine seemed to be a great solution, so he recoded the site in Python and moved it over to Google’s infrastructure." And it's easy to be blase what incredible scope these cloud platforms now offer. "On a free account, users of Google’s App Engine can host 500MB data, and serve up to 5 million page views a month. This is more than enough for a medium sized BitTorrent site. At the moment it is not possible to upgrade these limits, since paid accounts are not yet available, but this might change in the future." For free! Only five years ago such a hosting plus bandwidth environment would have cost tens of thousands of shekels. Such tales are the background to Paul Graham's expectations about the rise of cockroach enterprise in coming years. I mentioned in the last post that I'd been speaking to an executive from Microsoft Advertising about the relationship between offline media and the web, in the context of MS' Engagement Mapping project and its Death To The Last Click proposition. My point was that no one is offering a way to measure the affect of TV on web behaviour (and vice-versa) but the market is desperate to understand the relationship between the two media. I suspect the reason is that the marketing industry is still stuck in its traditional vs digital silos, and the two 'sides' view each other with suspicion. Real collaboration or the sharing of data just doesn't seem to happen. This is a massive blindspot in the marketing industry, especially in light of this post at Big Picture : "TV is now better value than it has been for ages. The credit crunch means lower demand is driving prices down and lots of data shows that people are watching as much TV as ever - despite the amount of time being spent with digital media. The new Ofcom report on the International Communications Market has some interesting facts that help explain this. Backing up our anecdotal findings we see that 74% of UK Internet Users surf whilst they watch TV - and 28% do it most times." Rather than recognising this modern view of the world, both 'sides' continue to bring out research celebrating the effectiveness of their 'own' media. Meanwhile, consumers (aka people) increasingly take the best of both worlds to create a richer experience. Computers used to be purely about their internal design with little thought given to appearance beyond the beige boxes they sat in. After all, they were almost exclusively hidden away under geeks' desks. 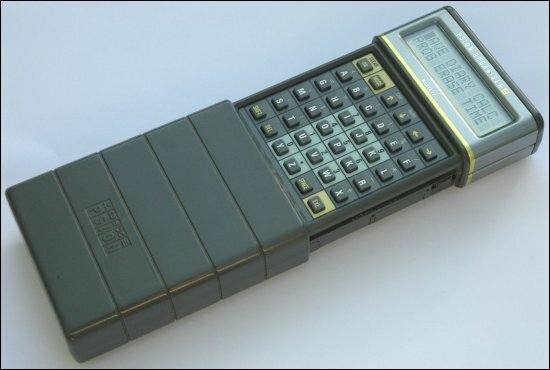 Then slowly came a period of more innovative machines such as Psions and Palm Pilots which went by the uninspiring catch-all 'devices'. But they were still clunky, unloved hardware. However, as computers became a primary way to stay in touch and organise life, their corresponding social status gradually improved - along with their design values. Today, we have a set of groovy machines which are as interesting on the outside as they are on the inside. The obvious star is the iPhone but a broader group of innovative machines that give people access to their online lives is steaming ahead. For example, there's Microsoft's remarkable table-top Surface computer, Google's G1 phone, Sony's Rolly, TV devices such as The Slingbox and Apple's TV, networked gaming machines such as Nintendo's Wii, Nokia N-Gage, and Playstation Portable - to name but a few. All high-design machines that allow people to connect to each other through funky interfaces that go beyond the keyboard. And as the network improves, particularly wi-fi, open-source spreads and Moore's Law powers on, the innovation and range of connected devices looks set to continue. In short, goodbye hardware, hello groovyware. How long before a brand commissions its own special networked device to hand out to consumers I wonder? MediaTrust is a great organisation which helps charities and voluntary groups by teaming them up with media and communications professionals to extend their fundraising and profile-building. It's also a client of mine. They recently asked me to add to their excellent marketing guides with some thoughts about blogging, which I've done as Ten Blogging Tips. Here's the first one: "Do You Need A Blog At All? : Blog is a widely used word and its definition has become a little vague. It means a website that is designed to foster two-way dialogue among a community of people interested in each other or a specific subject. Does that sound like something that you might find useful? Then great. If not there are plenty of other ways to become involved in social media. A blog can be useful but only if it's going to be used in the right way." The rest are here. What's your top blogging tip? Barack Obama wasn't the only big winner today. The FCC has announced that, as the TV networks move from analogue to digital platforms, a big wedge of Spectrum is to be freed up for unlicensed wireless devices and public use. The 'empty TV channels', as they are referred to here will be made open, meaning that everyone can become their own little wi-fi station, instead of the centralised carriers that exist currently. Practically, this means that, "consumers would buy a wireless phone at a store, but instead of being forced to use a specific carrier, they would be free to pick any carrier they wanted. Instead of the wireless carrier choosing what software goes on their phones, users would be free to put any software they want on it." All of which appears to be a huge win for Google. Why? As Larry Page says, "Ten per cent more connectivity in the US means more ten percent more revenue for us." In other words, a $2bn payday. Or as ZNet's Larry Dignan says: "Let me get this straight: Google prods the FCC to open up the airwaves. It enters bidding for 700 Mhz spectrum, jacks up the auction prices for carriers, doesn’t actually bid and now gets handed spectrum that’s arguably more valuable. Nice job, Google." Jeff Jarvis raves here about the decision: "Kiss those old phones and two-year contracts goodbye and turn to new, open devices that run software from - you guessed it - Google." Welcome to Google Android - Part II. Change - Do We Believe? Sometimes the good ideas are just staring you right in the face, aren't they? The decision by Hulu, the hugely popular Web TV service, to run fewer ads but charge more for them may just fall into this category. It's a move to break the horrible dilemma that has arisen within TV world. On the one hand, brands still crave TV's mass, albeit dwindling, audiences. On the other, consumers are busy filtering excessive or unhelpful advertising out of their lives, using DVRs or by going online during ad breaks. The result has been an erosion of belief in the power of mass media to influence people's behaviour, resulting in falling TV revenues, but also more advertising as commercial broadcasters try to pile-'em-high. Which, of course, only makes the problem worse, creating a sort of TV Death Spiral. This desperate situation has led to some truly strange claims such as the one about fast-forwarded ads being as effective as those watched at normal speed. Or that because people are watching more TV programmes they must also be watching more advertising. However, the fact remains - people still prefer free entertainment. So how can the books be balanced? Hulu have a very major advantage over traditional broadcasters. They know exactly how many people are watching their programmes, as people request them on an individual basis. The NBC-Fox hybrid doesn't have to rely on the vagueries of tiny panels of people to justify the spending of mega-brands' gazillions. By calling an armistice with battered consumers, Hulu is trying to change the nature of the exchange. Less (advertising) for the consumer means more (attention) for the advertiser - and therefore more (doshola) for the media owners. All backed by new and improved viewing data. It's a gamble, especially in the current marketplace. But at least it's one that tries to address the issues, not paper over them.